Calculating Feynman diagrams is generally a very complicated business. However, in certain cases it is possible to evaluate infinite sequences of scattering amplitudes. There are about a dozen known infinite sequences, with the most famous example being the Parke-Taylor amplitudes of QCD. These play a prominent role in Witten's recent paper linking gauge theory scattering amplitudes to a topological string theory. 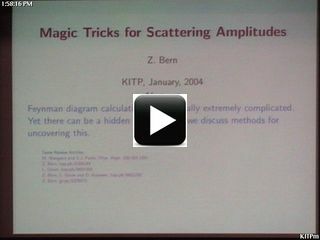 In this talk I will explain tricks that are used to obtain these sequences of scattering amplitudes. These include helicity methods, ideas from string theory, recursive methods, supersymmetry, unitarity and best of all how to guess answers.